A grey and rainy afternoon was beginning to clear up as my rattling car jostled down Walnut Street with fellow Baltimorean Sheldon Drake in the passenger's seat. Turning left at the shiny grey-and-black condominium building (that wasn't here last year, was it? ), a steeple was visible above the trees. It was time to get back to The Gatherings for another year, more musical explorations underneath the roof of the St. Mary's sanctuary. This time, I may as well have hitched a ride with someone else - tonght there were two separate acts coming from my home base, Baltimore, to share musings new and old. The mood in the sanctuary was light, maybe even a bit cheerful, preparations for the show were unhurried. Fresh breezes swept in through the doors, smells of grass and budding leaves, Nature's preparations for full-blown spring, while on the altar, more synthetic machinations were taking shape. On the left side of the altar, Jason Sloan looked over his laptop and guitar, with a small compliment of floor pedals sitting underneath. 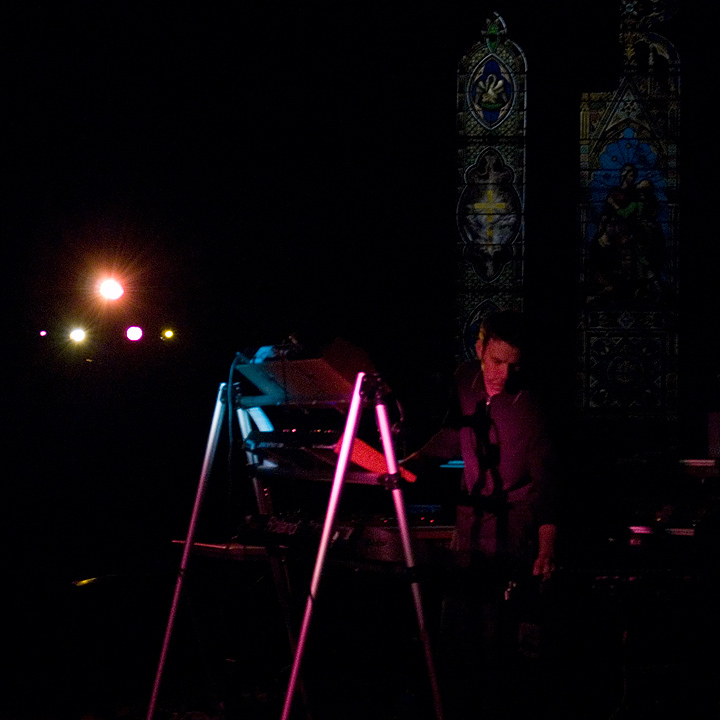 Meanwhile, Jeffrey Koepper tweaked and fine-tuned an array of synthesizers and vintage keyboards, lost in concentration, scribbling down notes and making sure every machine got its fair share of attention in time for soundcheck. 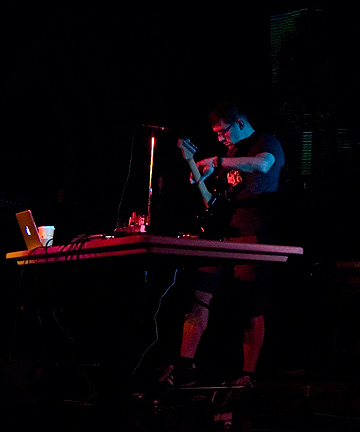 Jason Sloan intertwines his musical aspirations with a wealth of other creative endeavors (live performance pieces, webcasted musings, handmade package design, interactive media, teaching) while still maintaining a down-to-earth personality. On the front steps of the church we chatted about life in Baltimore as we watched our mutual friend Sheldon race back and forth across the grass, tossing a Frisbee with some students, shaking his arms and legs, removing the winter dust. A few early-comers headed up through the red doors with chairs and pillows, the beginnings of a crowd that was sadly a little too small to fit the high caliber of music on display. As the sunlight faded and the orange streetlights blinked awake, I closed up the doors and hit the light switch as Sloan took his place on the stage. A novel and lively set followed, not spacemusic in the very traditional sense, but very much mining the new traditions of labels like Apollo, Silent or Skam, moving out into deep, danceable territory with textural nods to the ambient and industrial music of the 70's and 80's. 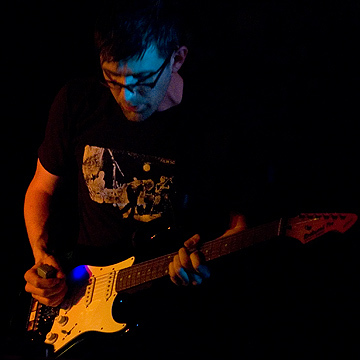 A rippling rhythm faded into the mix around the ten-minute mark and really helped anchor the moody drones and slices of guitar noise that Sloan was layering overtop. When one rhythm faded out, another more insistent one faded in, and that was when Jason, to my surprise, added some singing to his creative repertoire. Over his shoulder a microphone had been standing, and he added some heavily drowned and reverbed voice snippets, post-modern monkish chanting, maybe. When the laptop chattering subsided a bit, Sloan piled a few groans and ahhh's on top of each other, then held them there until the music built slowly back up, moving us into a new, even more radiant space. 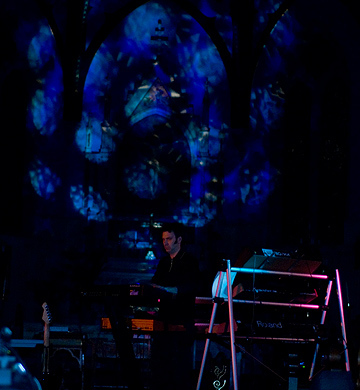 There was a hearkening back to Slow Six's performance, too, when a little handheld AM radio was held up to the mike, static and voice confetti blowing like dust motes around the church interior. Deep and meditative, perhaps a little mournful, the set was met with warm applause. 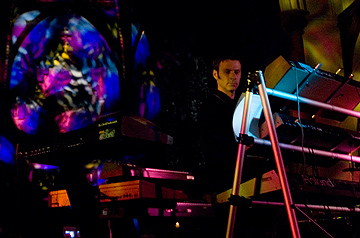 Jeffrey Koepper had made his first appearance at the Gatherings when hand-picked by Steve Roach for his church appearance in May 2007. I had barely heard any of his music that night, stationed in the vestibule as I was, ushering in a long long line of ticket-holders that never seemed to end. Tonight, though, my full attention was given to Koepper, who furnished over an hour of classic, clean, uplifting sequences in the classic spacemusic tradition. Always with his hands on two different keyboards, he led the audience through a retro reverie, focusing mostly on pieces from his newly-released CD, Sequentaria. The cosmic interludes were well-played, engaging, buoyant and sweeping like breaths of warm spring air, and the sequences were clean and bright. Near the end of his set Koepper seemed to finally warm up to his synths and "jam" a little bit, piling on colorful atmospheric touches with some upbeat sequencer patterns before letting everything recede down to just a few plaintive melodies at the very end. Sadly, neither artist decided to augment their church stay with a stint at STAR'S END, so after an equipment run to the van Zyl house, and a few hours of tea and tired conversation in the DJ booth, Sheldon and I spilled out onto the sidewalk outside XPN. The last tatters of the night's music were still stuck in my head as I laid down that night, thoughts of juxtaposing the old and the new, exploring deep space and internal space, at the hands of these two Baltimoreans. I thought it would be cool to have two musicians from the nearby city of Baltimore play concerts at The Gatherings. It's really not that far away from Philadelphia (about 100 miles) and over the past ten years or so has produced some most interesting artists, personalities and events. Among the current crop is Jeffrey Koepper and Jason Sloan, both contemporaries - yet exploring totally different realms of sound. 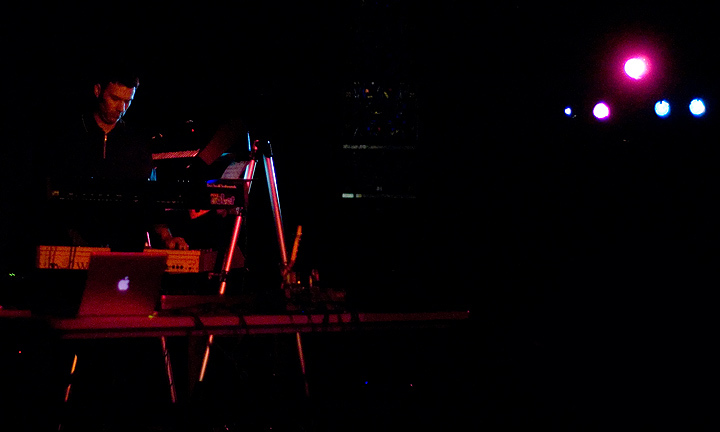 Plus, what with Koepper's triumphant opening set for Steve Roach on 05.19.07, the idea of having him back had been brewing for some time. 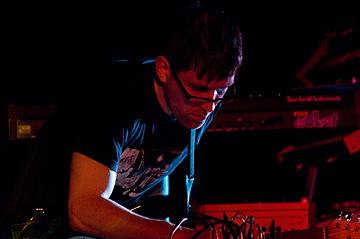 I'd had Jason Sloan play on STAR'S END a few times over the years, and knew him as an introspective soundscape artist. I've aired his CD "Still" on STAR'S END, as well as "A Bleeding White Silence". 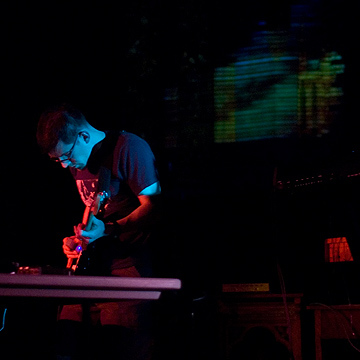 These works delve into two distinctly different areas of Ambient Music. His on-air performances captured both of these moods, and more. Also, having played so well on STAR'S END, I knew Jason was capable of holding his own on a stage when it counted most. For The Gatherings, I'd asked Jason to please put together a more active set, something with a bit of focus. His STAR'S END radio concerts were full of nuanced textures that gently led the listener across several soundscapes. I thought that The Gatherings concert audience would appreciate something that went well beyond atmosphere. What we got at The Gatherings was well beyond what I'd imagined. 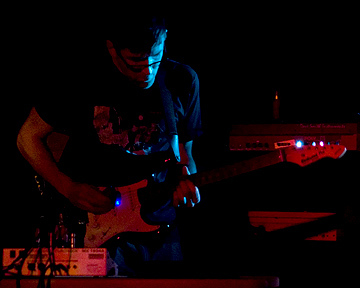 Opening with a dense cloud front of sound, Jason played his guitar through extensive processing. With its subtle changes in key this section drifted through the church sanctuary, filling the rafters with heavenly tones. As the chords echoed away an electronic percussion loop rose. This may have been the first time Jason has tried something like this; at least I'd never heard beats in his music before. It was wonderful; the rhythm kept building as Jason worked chords and effects over and under the pattern. Throughout the concert he would show innovations like this. 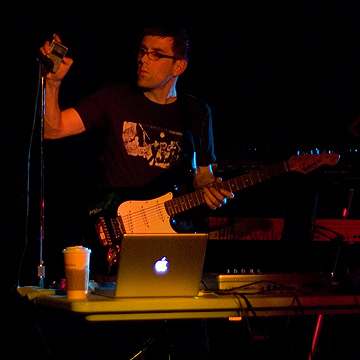 Along with playing AM radio static into an open microphone, he also used his voice to harmonize with the layers of electronic pads he'd built up, a warm human element to an otherwise digital experience. Sloan's set lasted about 30 minutes. In that brief time he said alot. His message was mainly about growth. 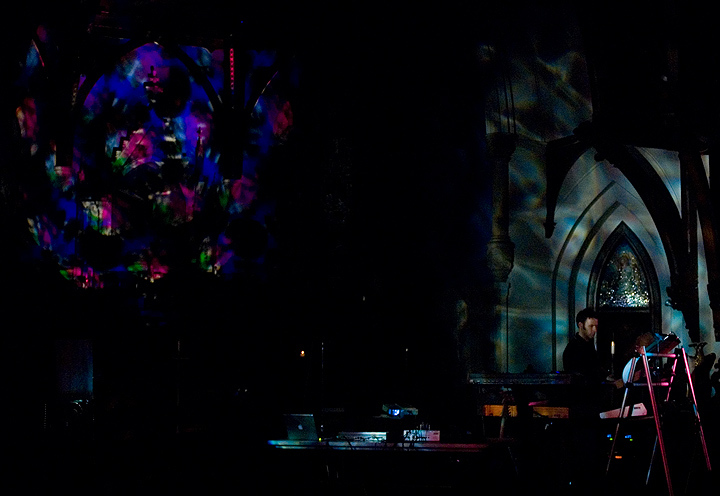 Like the way his synthesized sounds and echoing tones filled up the sanctuary, his music fills the listener with a creative presence. I'd first seen Jeffery Koepper when he was playing in the duo Pure Gamma. It was at a rave in DC during the mid-1990s. 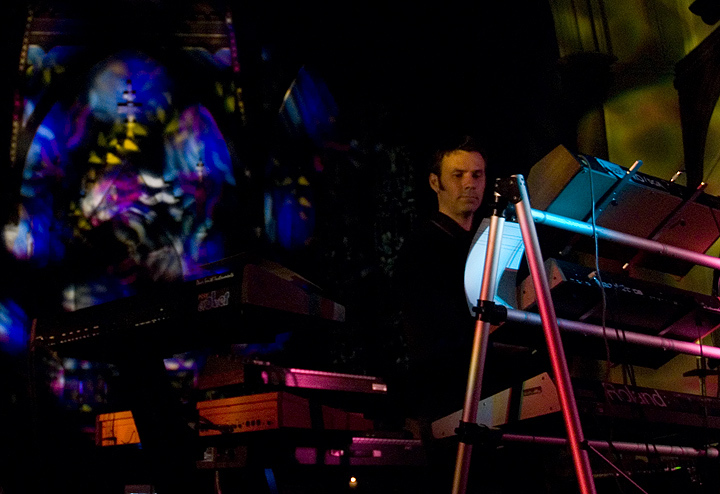 Their music was an interesting mix of the current modern chillout scene and old school spacemusic. It wasn't long before Pure Gamma played a few concerts at The Gatherings (09.28.96 and 05.02.97). The duo never managed to get their full-length CD released before they ceased making music together. Fortunately, Koepper incorporates some of their lasting musical ideas on his first solo CD "Etherea". Followed by "Momentium", Koepper again demonstrates ample technical craft and compositional ability in the studio. Having seen him play so well with Pure Gamma, I'd been after Koepper to play out live solo for quite some time. But it took the prodding of Steve Roach to see this realized. Koepper got it together at Roach's 05.19.07 performance at The Gatherings - which produced enough interest to get Jeffrey into a live on-air STAR'S END radio concert in early 2008 and on stage at The Gatherings this night. Koepper's set lasted about an hour and traversed much of the same territory as his last two outings (on STAR'S END and opening for Steve Roach). 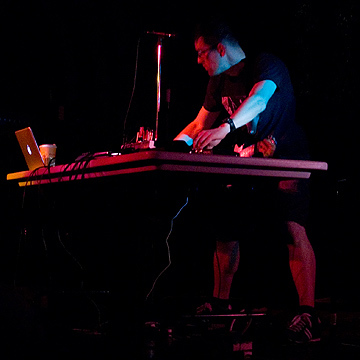 With an emphasis on works from his new CD "Sequentaria" (released at The Gatherings this night), the set began with some vintage phase shifted synth pads, heroic E-drums and dancing arpeggio scales. Drawing on the digital music era that spawned such albums as "Poland", "Logos" and "White Eagle"; Koepper ran through a fascinating range of sequencer based pieces - his full-throated lead lines soaring above. 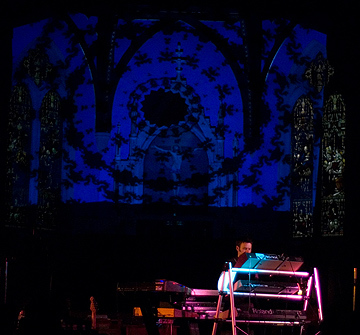 His stage set-up included several keyboards, among them vintage museum grade synths right alongside the latest retro analogue technology. Between each of the rhythmic sections Koepper used these instruments to lull the audience with deep drones and airy synthetic harmonies and effects. To close out the night, Jeff played lovely chord progressions on the Prophet-8 over a simple run of tones from the arpeggiator on the Jupiter-6. Looking back, this was the most honest and intimate part of his performance. Too bad there were not more people there to experience it. While the audience that did turn out was as enthusiastic as they were informed, it is financially difficult to produce events when attendance doesn't cover the basic costs. Plus, these artists deserve to be heard - what they are doing is worthwhile. The Gatherings Concert Series can provide them with a great sound system and a magnificent place to play, but an appreciative audience is perhaps more vital to their art. 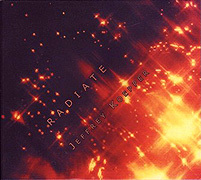 On 11 February 2009, the Ricochet Dream label released Radiate, a complete live recording of Jeffrey Koepper's 19 April 2008 performance at The Gatherings Concert Series in Philadelphia. Jeffrey Koepper w/Jason Sloan live at The Gatherings Concert Series on 19 April 2008 is funded by CIMA of PA (The Corporation for Innovative Music and Arts of Pennsylvania), the all-volunteer, non-profit organization responsible for organizing and producing The Gatherings Concert Series. The basic mission of CIMA of PA is to bring innovative music concerts to the public and further the advancement of this artform.